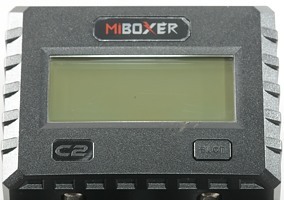 This is the second charger from Miboxer with their own name (The first one was called C4). 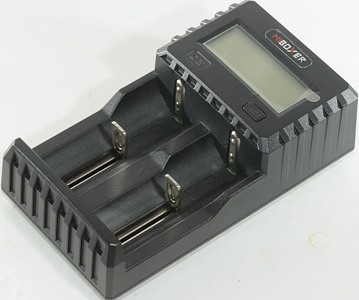 The charger is a two channel charger that can be supplied from 5V or 12V and can charger both NiMH and LiIon batteries. The charger comes in a retail box. There is some specification on the box. The pack contained the charger, a usb/barrel connector cable, a special car usb charger and a instruction sheet. The power input is a DC barrel input. When used with the supplied cable it can be supplied from a usb charger or from the supplied car adapter that will supply 12V to the charger. 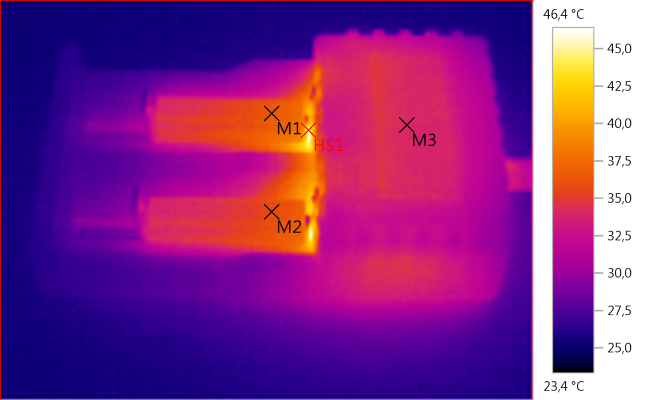 Being a 5.5/2.1mm barral connector it can also be used with any 5V or 12V power supply that has this type of connector (With + in the center). The user interface is fairly limited. One button to select what slots is displayed or turn the light off with a long press. Here is some examples on the readout. The C1/C2 shows what slot data is for. The : in the time is flashing, that is the reason it is missing from some pictures (Same goes for the battery/charge symbol above the mAh number). 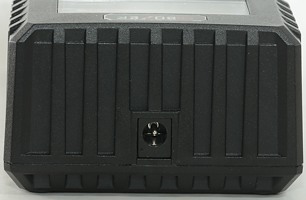 The battery slot are the typical slider construction, but are made to work with both small and large round cells. 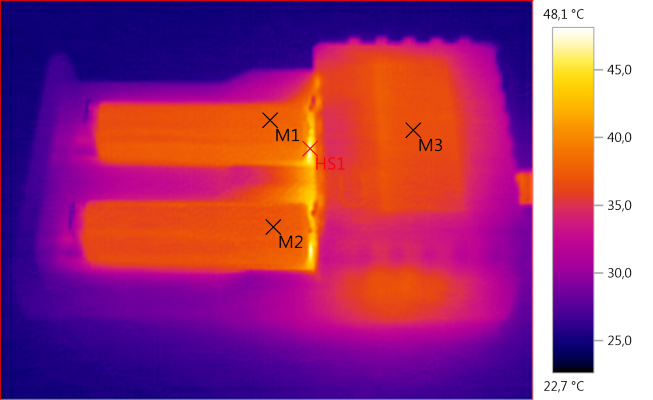 The slot accepts from 33mm to 72mm long cell and up to 32mm diameter, both LiIon and NiMH. The current will sometimes be too high for the small cells. 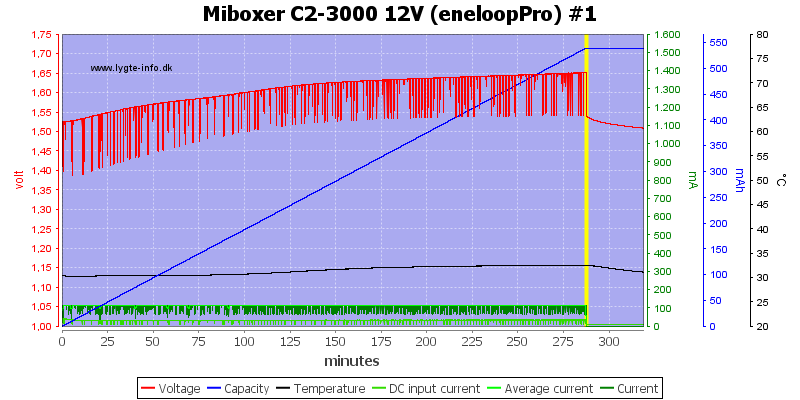 USB power consumption when idle is 14mA with lcd light on, 7mA with lcd off at both 5V and 12V. 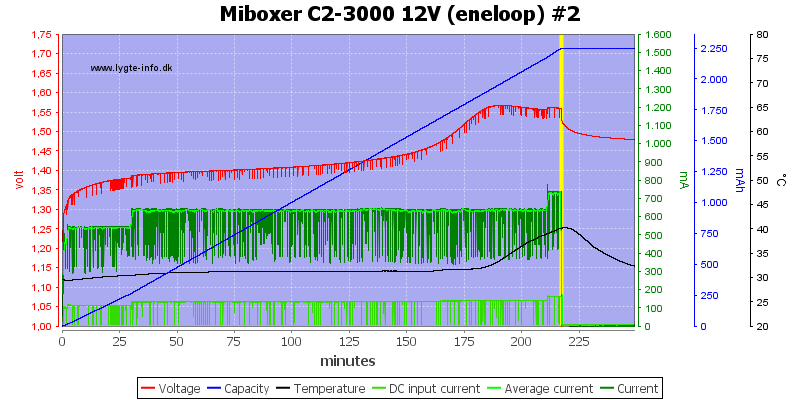 Will discharger a LiIon battery with about 31mA when not powered. 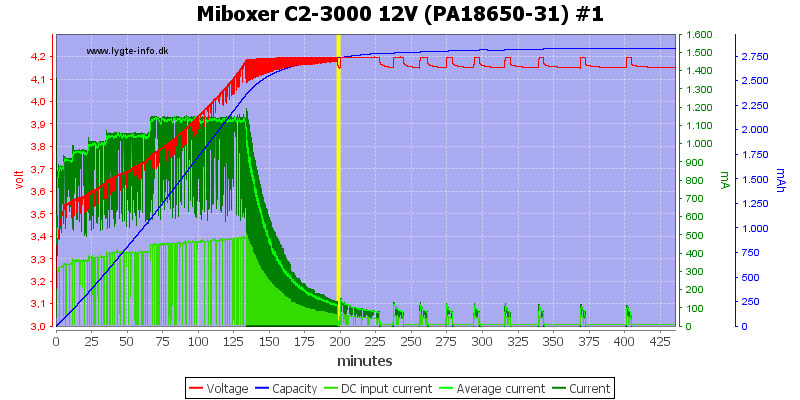 Will discharger a NiMH battery with about 0.3mA when not powered. 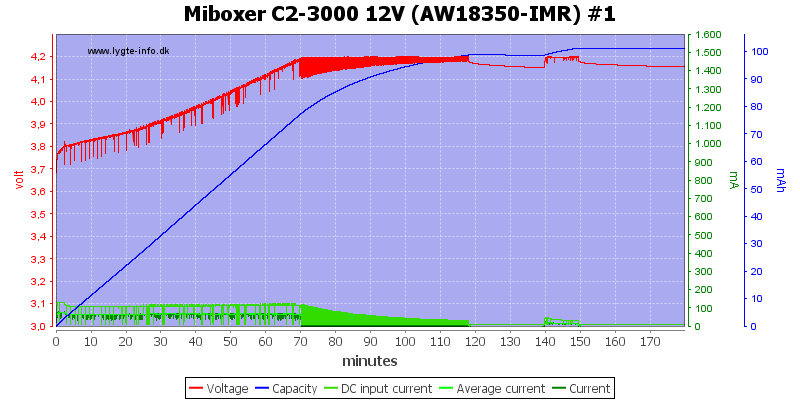 Will start charging just above 0 volt with 100's of mA (Depends on Ri). 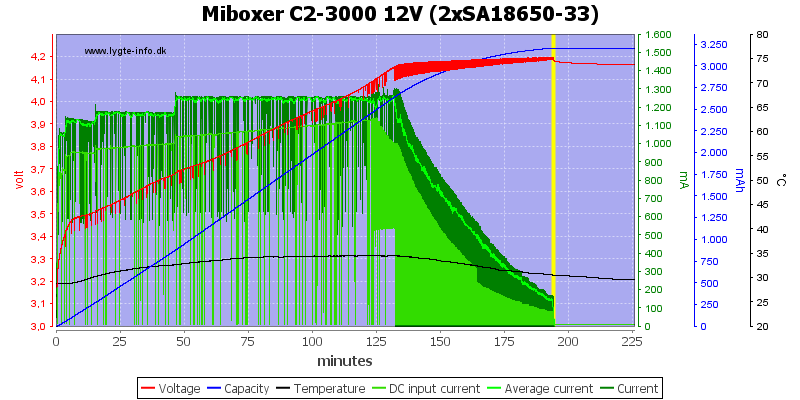 Assumes NiMH below 2.0 volt and LiIon above. Voltage is within 0.01 volt from 0.1 to 4.3 volt. Will restart on power cycle or battery insertion. 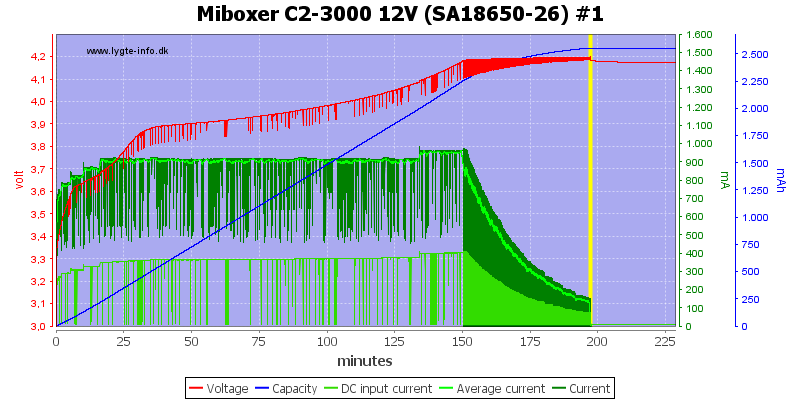 The charger will adjust charge current depending on the internal resistance in the cells, because my equipment add a small amount of resistance to the cell, some cells would have been charger with higher current than my test shows. 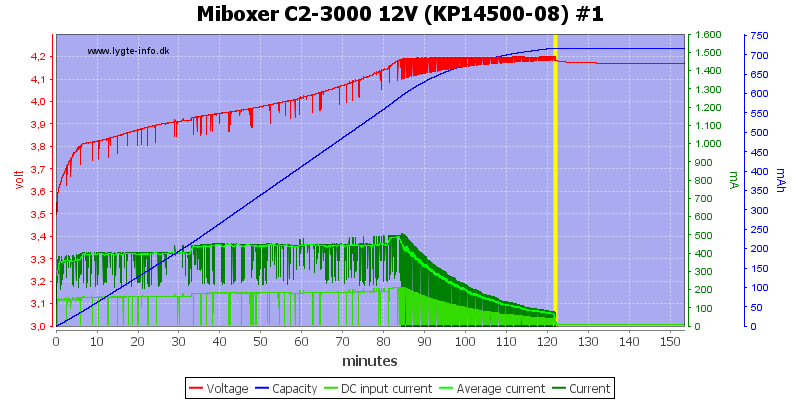 The charger current is about 1.4A and it is a nice CC/CV curve with a slow start, termination is at about 200mA. Second channel looks the same. 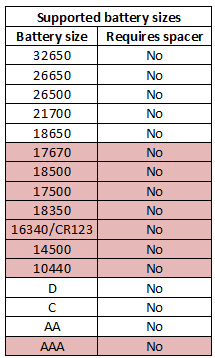 Display shows 3220mAh and Ri 77mOhm. 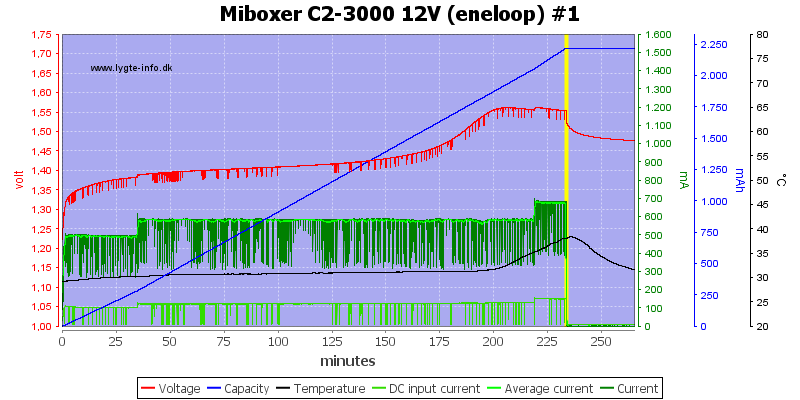 With this cell the charger measured a higher resistance and used a lower current. Display shows 2636mAh in 3:18 and Ri 101mOhm. This cell is a bit old, this means higher resistance and on this charger is also means lower charge current. Because the voltage on this cell drops, the charge will restart charging, but it is done silent, i.e. it is not visible on the display. 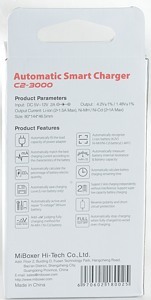 Display shows 2800mAh in 3:19 and Ri 255mOhm. This is a much older cell and the current is turned way down. the termination current is also very low here. Display shows 2004mAh in 9:59 and Ri 566mOhm. A smaller cell will usual have higher resistance, this means lower current. In this case with a slightly old cell and my test equipment connected the current is low enough for the cell, but with a new cell it would have been on the high side. Display shows 722mAh in 2:02 and Ri 241mOhm. This is a very old cell and the charger turns the current way down. 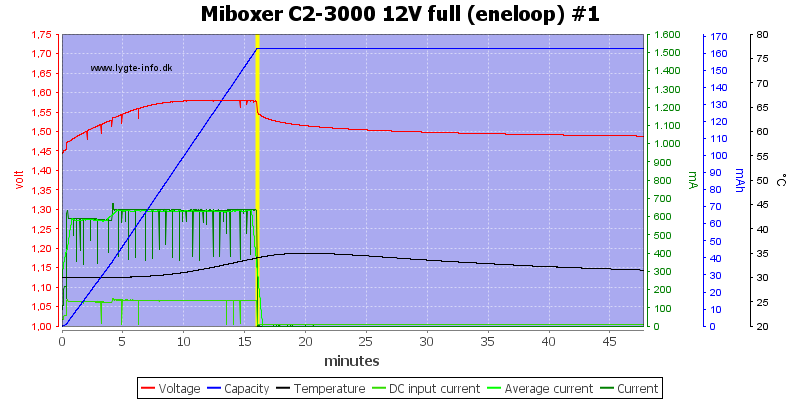 Here I am charging two cells with 12V supply, the charger do not supply full current, but it is a fairly fast charge. Display shows 3357mAh in 3:15 and Ri 95mOhm (This is the channel I have recorded the curve for). Display shows 3307mAh in 2:45 and Ri 62mOhm. 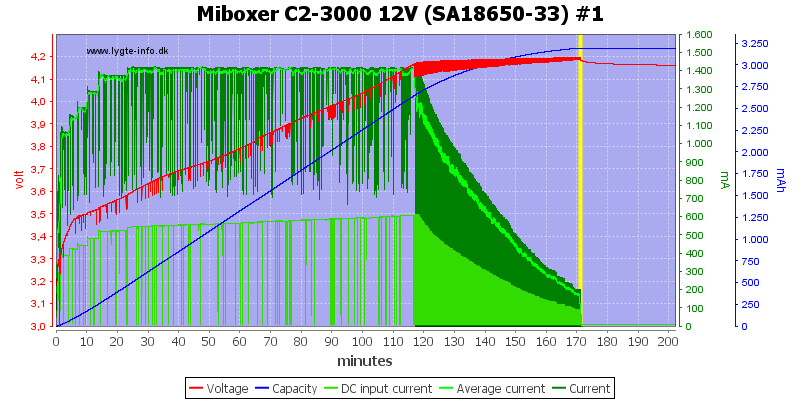 Display shows 3291mAh in 5:22 and Ri 95mOhm (This is the channel I have recorded the curve for). Display shows 3378mAh in 4:51 and Ri 43mOhm. 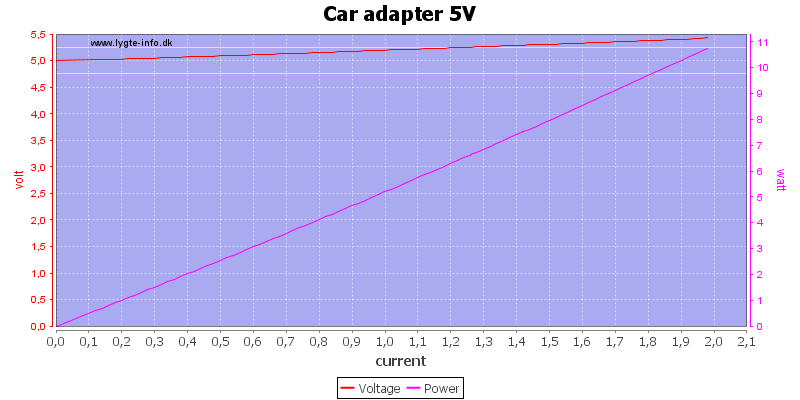 Add 0.5ohm in series with the 5V to simulate a long cable or weak charger will reduce the current very significantly. Display shows 2956mAh in 9:59 and Ri 69mOhm (This is the channel I have recorded the curve for). Display shows 3134mAh in 9:59 and Ri 58mOhm. The display shows 9:59, but the charge took longer, i.e. the 9:59 is maximum readout, the charger will not stop, but continue charging without counting more time. The temperature is from a 12V charger without any of my equipment connected. The charger and batteries stays fairly cool. 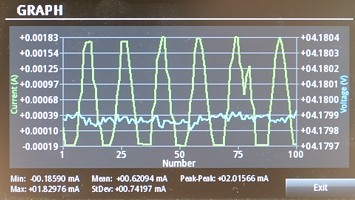 My oscilloscope pickup adds 100mOhm to the circuit, this means the current will be fairly low. Notice that before I power on the charger the red current line is below zero, the charger discharges the batteries when it is not powered! The charger will turn the current off at regular intervals, probably to both measure voltage and estimate internal resistance. 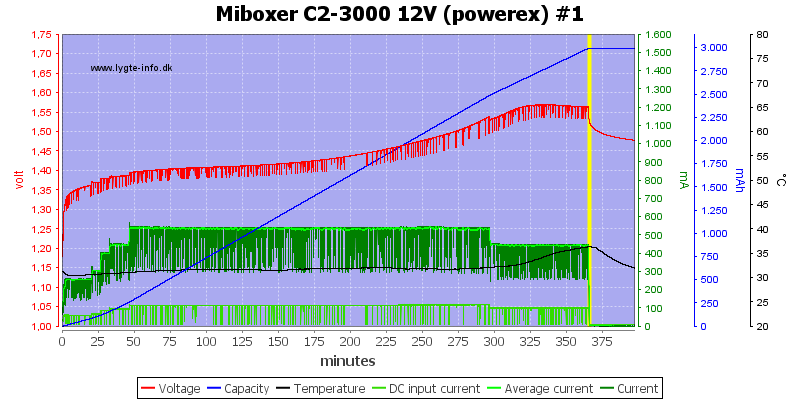 The charger will slowly increase power when starting as can be seen here. A full LiIon battery will be charged a bit, then discharged, the current is low enough that it is not really significant. 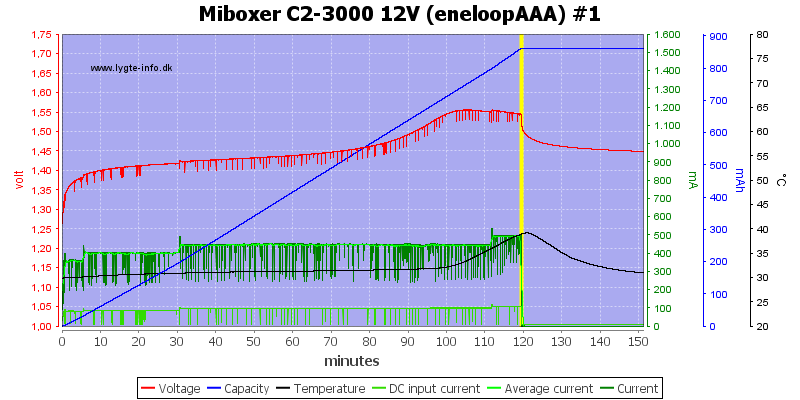 The maximum charge current for NiMH is 1A. 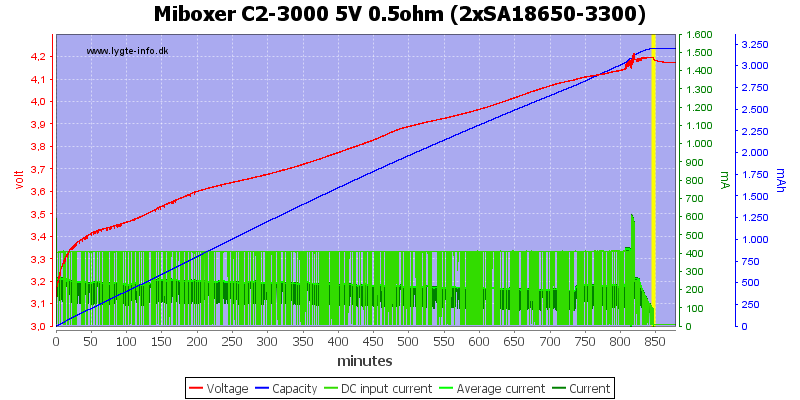 This is a nice -dv/dt charge curve, I could have wished for higher charge current. Display shows 1818mAh in 3:54 and Ri 43mOhm. The second channel looks just as fine. Display shows 1822mAh in 3:38 and Ri 41mOhm. The This cell also looks fine. Display shows 2356mAh in 4:45 and Ri 64mOhm. Something is wrong with this cell, as can be seen on the resistance measurement. Display shows 156mAh in 4:48 and Ri 999mOhm. This cell is also charged fine. Display shows 2421mAh in 6:06 and Ri 76mOhm. Display shows 666mAh in 2:00 and Ri 66mOhm. 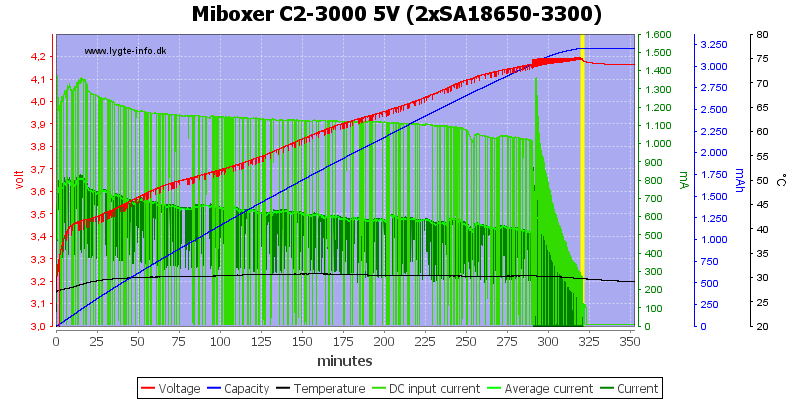 The charger needs some time to detect the full cell, as usual with -dv/dt chargers. Display shows 32mAh in 0:17 and Ri 51mOhm. 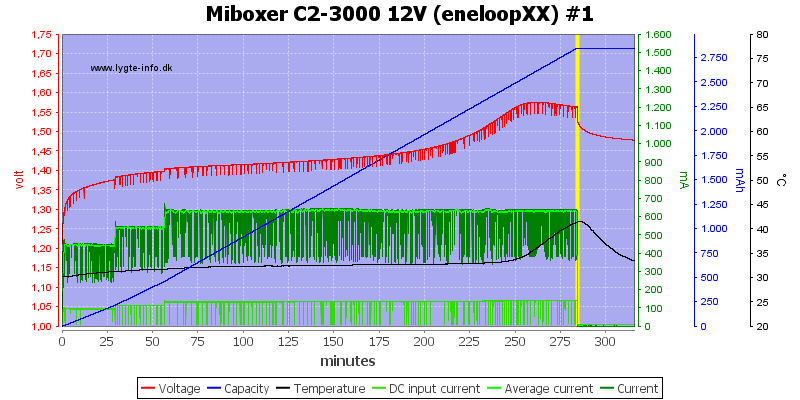 Two cells, the temperature sensor is on the other cell and it finish first due to lower resistance. Display shows 1814mAh in 3:04 and Ri 38mOhm. Display shows 1822mAh in 2:50 and Ri 31mOhm. The charger needs about 3 seconds before it starts charging. During charging it will pause once in a while to measure voltage and probably also internal resistance. Looking over a bit longer time makes me wonder why the pauses are at iregular intervales and why the current is reduced before each pause. The results are faily good, but there is a bit too much variation at the low end. 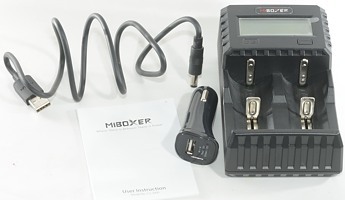 The charger includes a usb car charger that can deliver either 5V for normal usb equipment or 12V for the charger. 12V is a proprietary coding. 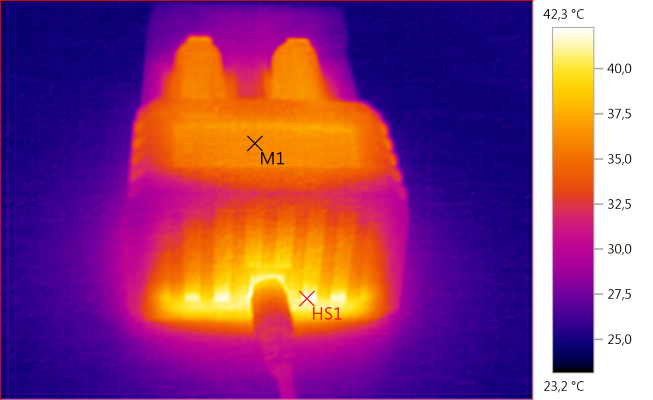 The 5V output compensate for some cable loss by raising the output voltage when current increases. It has a overload protection at 2A. 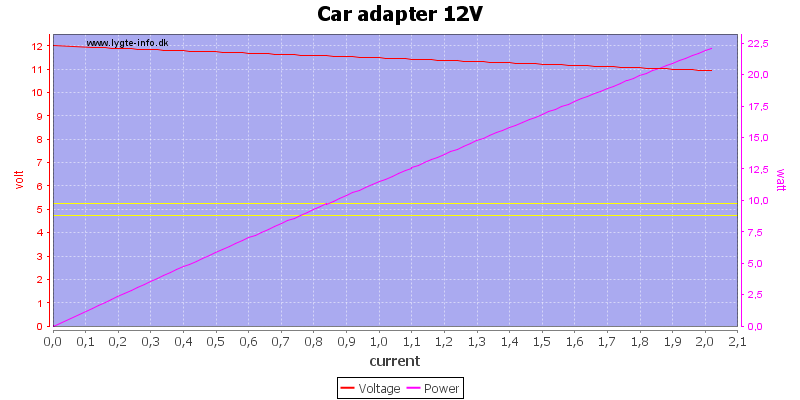 The 12V output drops, this is probably due to cable and connection looses, but the voltage is more than enough for the charger to run at full power. It has a overload protection at 2A. 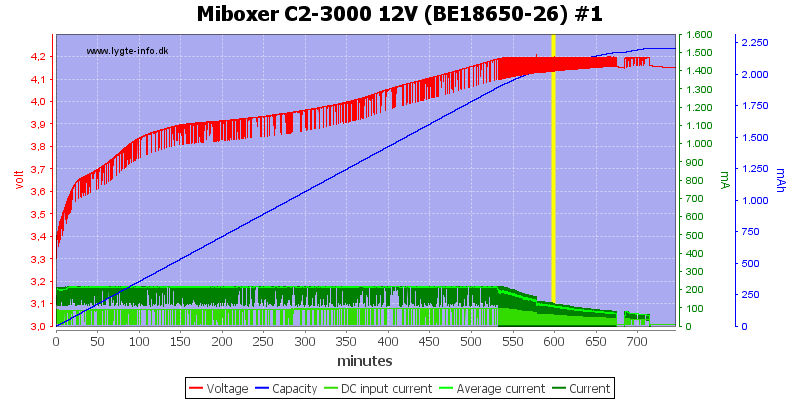 That the standard LiIon charge current goes up to 1.5A is fine for 18650 and larger cells. 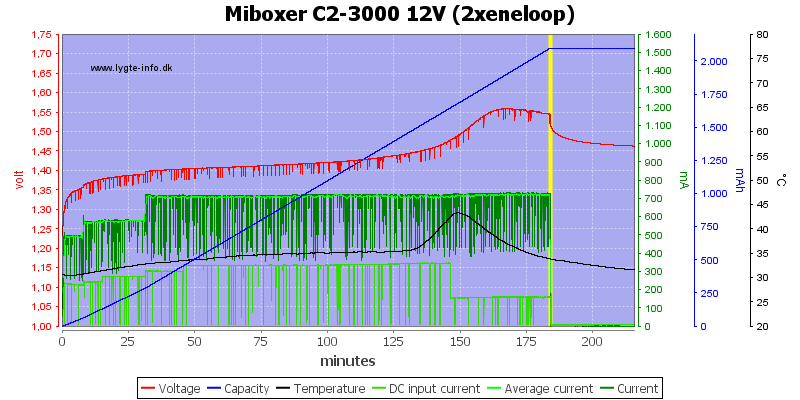 The charger uses the internal resistance in cells to regulate current, in my test it has worked fairly well, but I have not tested with a new small cell. 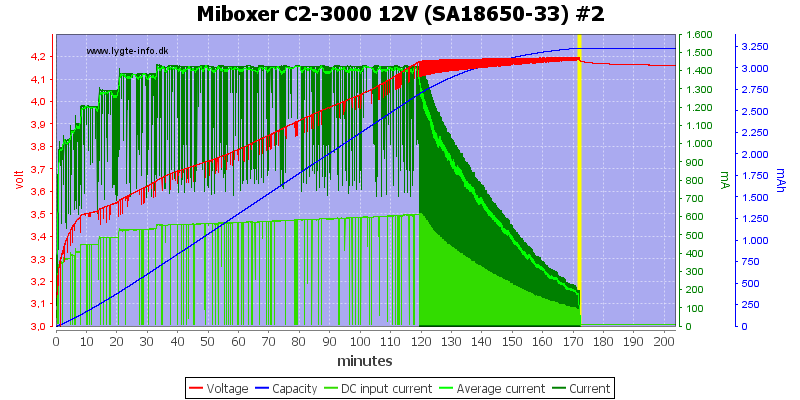 A way to limit the maximum charge current to maybe 500mA would be nice. 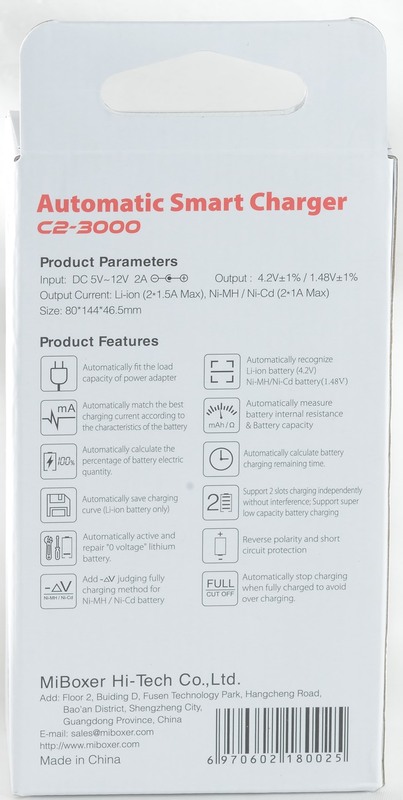 The automatic current adjust will probably improve the lifetime of the batteries, because they will always stay fairly cool, but it do also mean it takes longer to charge old batteries. It is important to remove LiIon batteries from the charger when it is disconnected from power or it will drain them. 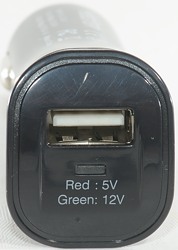 As supplied the charger works in a car or with a usb charger (Power is reduced), but requires the supplied special cable. 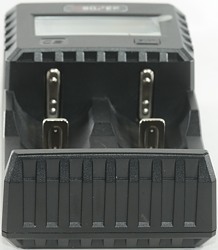 As supplied the charger can work with other 5v/12V power supplies that uses a 5.5/2.1mm barrel connector. 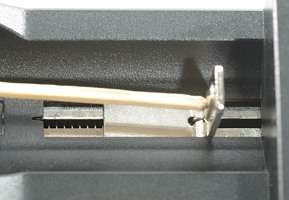 I like the barrel connector, but a supplemental micro usb would have been nice (It is hard to make it physical solid enough). I am not very happy about the proprietary coding for the usb, Quick Charge would have been nicer. All in all it is a good charger for NiMH and 18650 and larger cells, with smaller cells in will probably be a bit hard on them when they are new. 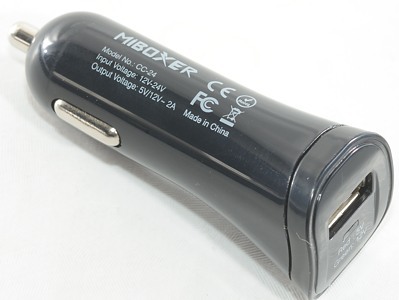 The charger was supplied by a Miboxer for review.